In the rough and tumble of daily life, it is doubtful whether many people have the time to consider the origins and history of their local bus route. After all, most people’s interests in such matters are understandably utilitarian. One of Swansea’s busiest routes, however, does warrant special consideration – that serving the Townhill area via the very steep Mount Pleasant Hill. Exactly how to provide public transport on Swansea’s steepest hills had exercised minds for a number of years. At the turn of the last century a cable tramway on Constitution Hill had ended in financial failure and the electric street tramway network could only handle relatively easy gradients. Swansea Council’s substantial housing developments at Townhill and Mayhill put further pressure on transport operators and eventually, in the early ‘twenties, SWT identified a solution – in Switzerland. One of the Swiss built Saurer buses near the bottom of Mount Pleasant Hill. In 1926 the company purchased a batch of Swiss-built Saurer buses which were fitted with ratchet brakes to prevent them running backwards. Public concerns over safety resulted in the company offering free travel for the first three days of the new service, in a bid to entice people to travel. Further similar vehicles were added into the fleet in 1930. From those days until relatively recently, the single deck buses used on Townhill have been types which have been specially modified to suit the gradient which varies from 1 in 13 to 1 in 5.6 at its steepest. These vehicles, therefore, hold special interest although the extra wear and tear on brakes and transmission units has always meant higher running costs. had to grit the roads on wet days. Following on from the Swiss Saurers, British built AEC Renown six-wheelers were purchased in 1933 and 1934. These were the first diesels delivered new to SWT and were fitted with 8.8 litre “oil engines”. The lower axle weight of the six wheelers presented an additional problem in wet weather as they were prone to loss of traction on the greasy surfaces. The Borough Engineers Department attempted to resolve the issue by gritting the road on wet days! but these were recorded to be reliable buses. A SWT AEC Q. Note the single rear wheels – these also had problems gripping the road. It is clear that further attempts were being made to find suitable buses for Townhill and several different types of vehicle were tried in subsequent years. In 1935, five Daimler single deckers with low axle ratios and five speed gearboxes arrived, accompanied by five ground breaking AEC Qs. The jury is still out on whether the design of the latter was ahead of its time, or a dismal failure. Either way, the side mounted engine meant that modified suspension was required and this type again was prone to losing its feet on damp roads. The Daimlers are reputed to have been very reliable, although expensive buses. More AEC Renowns appeared on the scene in 1939. This time, both rear axles were driven in a bid to resolve the traction problems. Preselective gearboxes had become standard by now, the philosophy being that this minimised the risk of a missed gear and therefore of the bus running backwards. FWN 506 was one of the 9.6 litre engines AEC Regals purchased in 1949.
although at times this alternated with Trinity Place as postwar reconstruction progressed. No further new vehicles for Townhill were purchased until well after the end of the war. In 1949 a batch of AEC Regal IIIs appeared on the scene. These were of a much more standard design when compared with the types that had been used hitherto, although when new their air brakes had a two-stage action for which drivers had to be specially trained. Poor driving usually led to fierce braking causing discomfort to passengers and heavy brake liner wear. 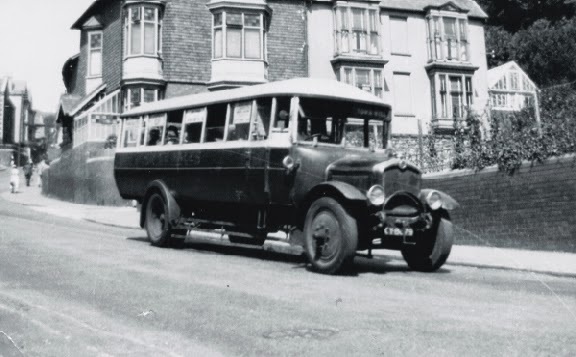 Following an experiment with one vehicle in September 1949, all eighteen similar buses were subsequently modified to more conventional braking. Another demonstration vehicle, on trial on the Townhill route. NLP 635 was an AEC Park Royal Monocoach, predecessor to the Reliance. Manufacturers were keen to see how new models could stand up to conditions on Townhill. the hill day in and day out for many years and were a tribute to their manufacturer. the large number of ships being worked at Swansea Docks. In 1955 the new AEC Reliance design made its debut in the fleet. Eight were purchased and carried the distinctive cream Park Royal ‘wings’ on their fronts. These were of semi-automatic configuration, again, to allay fears about missed gear changes. These robust little 44-seat buses were arguably amongst the most successful ever operated on Townhill and became very much icons of the service; having battled up and down day in and day out, they lasted in the fleet until the early 1970s. TCY 665 was a 1962 AEC Reliance with Marshall bodywork. This was one of the last 30 footers built for Townhill. Updated versions of the AEC Reliance, but with a much more plain 45 seat bodywork design, followed in 1960, 1961 and in 1962. For the technically minded, these were fitted with what was known as ‘dry sump’ lubrication with a separate lubricating oil tank, to prevent oil starvation on the hill. Curiously, certain of these vehicles later carried advertisements for a furniture store pasted flat on their roofs. Also in 1961, the Reliances used on Townhill were renumbered in the 1800 series to distinguish them from similar buses not equipped for the hill. A change to the law in 1961 meant that future single deckers could be of 36 foot (11 metres) length, as distinct from the 30 footers which had been permitted since 1950. Although several of this length appeared elsewhere in the SWT fleet, the first bought specifically for Townhill appeared in 1968-69 and were numbered in the 1900s. One of the final batch of special vehicles built for Townhill; a 1968 Reliance 53 seater. can be seen in the roofline. A total of fifteen of these attractive Reliances were purchased and all were equipped to a Townhill specification with heavy-duty axles, even though several of them were allocated to depots away from Swansea. Certain of this type were used for an experimental livery incorporating white into the window surrounds and an innovative heating and ventilation system. Modern refinements such as heating elements laminated in the windscreens were intended to make drivers’ lives easier and contribute to safety. Significantly, a couple of them later numbered amongst the last AEC single deckers in the fleet when withdrawn in the late 1970s. These also were the very last specially built buses for Townhill. The more powerful engines fitted to the Leyland Nationals and Dennis Darts which succeeded them made the requirement for unique braking and transmission systems unnecessary.